NETWORK UPDATE: THE BIG BANG THEORY and CASTLE each lost 0.1 in final numbers, and THE VOICE gained 0.1. ESPN’s MONDAY NIGHT FOOTBALL was naturally at the top of Monday cable at 4.58, although down 0.24 from last week’s game. LOVE & HIP HOP HOLLYWOOD (VH1) gained 0.13 to rank 2d at 1.33, and the rest of the VH1 line-up had TI & TINY at 0.83 (down 0.05) and TINY & SHEKINAH’S WEAVE at 0.69. The 3 hours of WWE on USA were at 1.20-1.25, roughly even with last week. A regular episode of FAST N LOUD on Discovery was at 0.79 (apparently last week’s 0.37 show was a special). MTV ran 2 episodes of ARE YOU THE ONE? 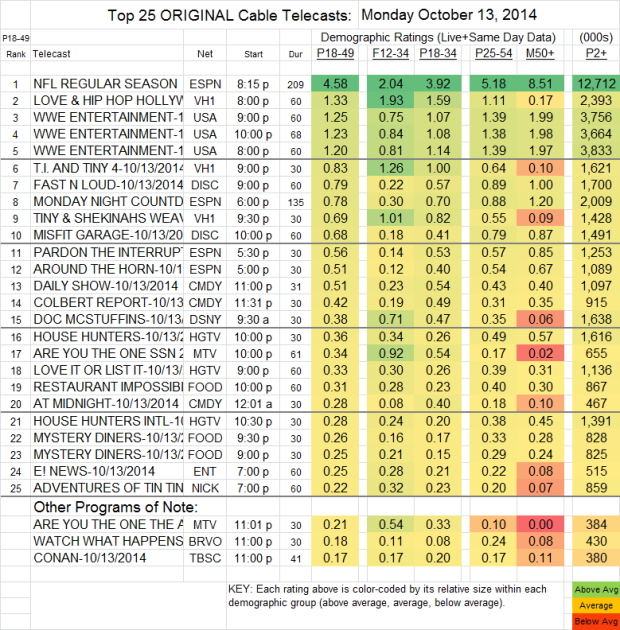 at 0.34/0.21, the earlier episode tied with last week’s.